Pros: The cast are divine creatures from an undiscovered planet where only great actors and actresses are born. Cons: None to mention; this production is flawless. A truly powerful piece of storytelling with an exciting cast. Miss it and you miss something very special. 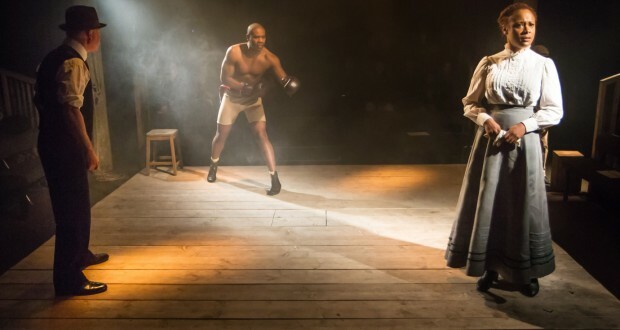 The Royale is a new story for London, as the Bush presents the UK premiere of Marco Ramirez’s beautifully written play about Jay Jackson’s pursuit of the heavyweight boxing title. Set in a segregated United States, Jackson’s challenge of retired champion Bixby pits a black and white man against one other inside the boxing ring at a time when racial tensions beyond the rope were also bloody. Plays have been written before about the peaks and troughs of the athlete’s journey, but this feels like something entirely different, and much newer, much closer, than the period the story lives in. 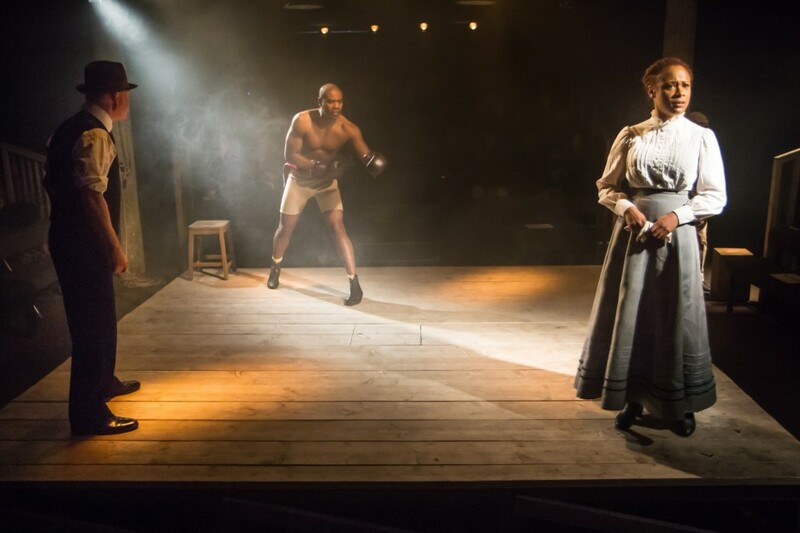 Nothing is predictable or familiar about this play and its characters, and even if you think you recognise the ‘fight’ you’re wrong, because Ramirez is smarter than that; his characters are. Taking my seat in the round of the Bush’s theatre, I could have held a ticket for a professional boxing match, looking as I was at the perfectly square wooden stage that was also Jackson’s boxing ring. The bare hanging lights were akin to gas lamps, and watching dust drift slowly upwards across their moody glow took me straight to the turn of the 20th Century. Equally training gym and public arena, the set is utter simplicity and utter genius. In the simple space takes place a stunning choreography of light and sound. 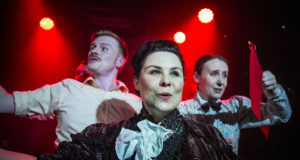 The lighting design is bold and inventive, so integrated with the direction on stage that it supports every shift in time and space within the play. Accompanied by hard, sharp sounds, the light moved us through time in the way that films often do with fast visuals and perspective switches. Coupled with the actors’ movements and words on stage the pieces came together like a perfectly composed piece of music. The Bush is one of my favourite theatre spaces in London, not only because I once enjoyed a lovely hot lemon and ginger drink on a cold day there, but because I’ve never been uncomfortable in their auditorium, and the front of house spaces are lively, welcoming and characterful. The building maintains the attitude of the library it once was. A gorgeous library-come-drawing room at the theatre’s front opens its non-judgemental arms to visitors in the way that only certain public spaces can. The last time I reviewed at The Bush I also gave five stars, and I don’t think this trend is a coincidence. They know what they’re doing and I’m hooked up to the drip. The Royale lives up to the expectations I have for this theatre, and no more so than its casting. Every performance is thoughtful and considered. 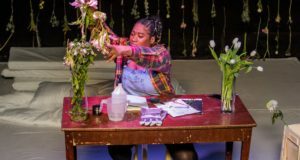 Ramirez’s rich dialogue, concise and yet expansive, so heavy with meaning, is spoken as if the actors have lived their character’s lives before and after the play’s limits. Nicholas Pinnock, Ewan Stewart, Gershwyn Eustache Jnr., Clint Dyer and Frances Ashman all deserve praise for their splendid performances, which stole my attention without break for ninety minutes, moved and surprised me. I know it’s only March but I don’t see how The Royale is going to be topped in 2015. What a knockout! Charlotte loves the theatre and hopes to make money out of it one day, after losing so much to the stalls over the years. Adores Chekhov and abhors Pinter. If you want to find out more then buy her a flat white.